I spent the last few days trying to decide if I should participate in Na(tional) Blo(g) Po(st) Mo(nth) this year. 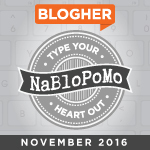 I found no information about NaBloPoMo 2017–not even from Blogher, which normally hosts and offers prompts and support for participants–so I decided NaBloPoMo would be a no-go for me this year. The blog goddesses had other plans. Just a few moments ago, I received a message that someone added me to the NaBloPoMo support group on Facebook, so here I am…with an almost last minute post for the first day…because I can’t miss day one. Have you seen the seven-day black and white photo challenge on Facebook? The challenge is simple: Someone tags you to post a black and white photo daily for seven days. You must tag a different person every day. There can be no people in the photos and there can be no explanation. Easy-peasy, right? My brother, Dennis, tagged me, so of course, I had to do it. I completed the challenge yesterday, so I’m sharing the photos here with “brief explanation” (since I suppose the rules do not apply to blogs). [With the exception of “The Birds,” the photos were shot with my iPhone]. I captured “Look Toward the Light” as I was leaving work one day, weary and ready for bed. The clouds were dark with promise of rain, but the sun burst forth and gave me the energy I needed to get through the evening. While waiting in the carpool line for my son to get out of school, my eyes locked on my favorite keyring. I bought the keyring almost two decades ago in England (which has the cutest teddy bear items). This bear has been carrying my keys ever since. The Instagram page “I Have This Thing with Bikes” (which features amazing bicycle photos from all over the world) has me hooked on photographing bikes whenever I see them. I caught this one on the way to pick up lunch from the Market on campus. Its owner was obviously “out to lunch” too. This camera and I are still getting to know each other. The shot is the result of my waiting for a program to end. I placed the camera on a chair next to me and we sat quietly studying each other. This is the top of a box filled with goodies from Aleta, one of my besties. She loves giving gifts and she takes so much care with presentation. Her signature style involves enclosing gifts in decorative boxes that can be used for storage and/or display. I stepped out of my office yesterday to take a quick walk and get some fresh air. What I encountered felt like a scene straight out of Alfred Hitchcock’s The Birds. There were hundreds of birds on the lawn a few feet away. When someone walked near the birds, they (all) took flight in a seemingly single move. The photos show they were not as uniform in movement as they appeared, even from a slight distance. But the sound of hundreds of birds suddenly moving “in unison” was a bit unnerving. After watching the birds for a few minutes and capturing a few photos, I decided to take cover in the safety of my office, just in case the birds had other ideas. This is a fun challenge. If someone tags you, go for it. It’s a nice distraction from the everyday normal. First day done, 29 more to go. Eek! Let’s see if we’ll make it to the end this year. Great photos! Can’t wait to see what the rest of the month shows you. Great photos! Welcome to NaBlo!! Gorgeous photos Chandra!! I am learning so much from you in the short time we have been paired up by Love Notes! I have joined the Global Art group and just got my three names to send to today! I have never heard of NaBlo, but I will be checking it out for sure now! I wish I could write and photograph as eloquently as you do!! Thank you so much for your kind words, Lori! You’ll love the Global Art swap too! NaBloPoMo is a big challenge, especially when you have something going on. I have a backlog of blog posts, so that’s what motivates me. Plus, blogging provides a nice break from the daily madness. Happy to have met you through Love Notes!